Nomad Factory is proud to introduce Echoes, a new Analog Echo Box plug-in designed to give you the warmth and richness of classic vintage delay effects. Following the philosophy behind Nomad Factory's hit Magnetic plug-in, Echoes not only sounds amazing, but it is designed to be very easy to use. 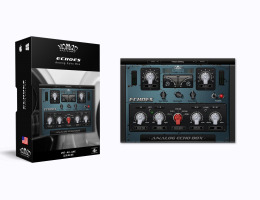 Unlike many other delay plug-ins that have dozens of unnecessary knobs and confusing parameters, Echoes has captured the essence of the original effects by keeping it simple. With the turn of a few knobs, the plug-in delivers musical results and instant analog delay satisfaction! The world's first delay effects were achieved using tape loops improvised on reel-to-reel systems in the 1950's. The dawn of the analog delay came in the 1960's with the Maestro Echoplex. Many guitarists embraced the technology as a way to enhance their sound including Robert Fripp, John Martyn and Jimi Hendrix. Often incorporating vacuum tube-based electronics, vintage analog delay units are highly sought after by today's musicians who desire the unique timbres achievable with this technology. Solid-state delay units using transistors became available in the 1970s and were briefly a mainstream alternative to tape echo. Though solid-state analog delays are less flexible than digital delays and generally have shorter delay times, several classic models such as the discontinued Boss DM-2 are still regarded for their "warmer", more natural echo quality and progressively decaying delays. ECHO TIME : Controls the time from 20 to 2000ms of analog delay. PANNING : Center position for stereo pan, left or right causes ping pong effect. ECHO MODE : Choose from 5 classic analog delay effects. REPEATS : Controls the feedback amount of the delay effect. MIX : Controls the balance of the wet /dry signal. EXTRA KNOBS : 3 additional preset knobs that change according to the currently selected mode. SYNC SWITCH : Sync your delays to your song's master tempo. VINTAGE SWITCH : Give your delays that vintage analog sound by filtering the repeats. STEREO WIDENER : Increases the width of the delay. Lowest setting is true mono. INPUT : Sets the input level of Echoes. OUTPUT : Sets the output level of Echoes. Macintosh Intel Core Solo 1.5GHz with 1Gb of RAM. Mac OS X 10.7 or above. Compatible Intel Macs, PPC are not supported. Apple Compatibility : AAX, RTAS (Pro Tools), AU and VST plug-ins. 32-bit and 64-bit are supported. You can authorize our software on up to 3 computers with a simple one-click authorization procedure (no dongle key required). Pentium iV 2GHz / Athlon XP 2GHz with 1Gb of RAM. Windows XP or above (32-bit and 64-bit). Windows Compatibility : AAX, RTAS (Pro Tools) and VST plug-ins. 32-bit and 64-bit are supported. You can authorize this software on up to 3 computers with a simple one-click authorization procedure (no dongle key required). DISCLAIMER * All product names used below are trademarks of their respective owners which are in no way associated or affiliated with Nomad Factory. These trademarks of other manufacturers are used solely to identify the products of those manufacturers whose tones and sounds were studied during Nomad Factory's sound model development.